Russ Henshaw will take the win for sure. strayln_Skier Russ Henshaw will take the win for sure. Woodsy wouldn't be too shocking. VinnieF Woodsy wouldn't be too shocking. Depends on your definitions, he almost never podiums or at least not in the big comps. He seems to always have interesting runs, but either crashes or isn't favored by the judges. So the snowboard qualifiers are done... are we going to see the skiers making better use of the interesting rail features? I realise it wasnonly qualifying, but the snowboarders didnt really seem to be making the most of those rails. What So the snowboard qualifiers are done... are we going to see the skiers making better use of the interesting rail features? That would make sense, still would be amazing to see, if someones gonna do it, its probably gonna be Henrik.. 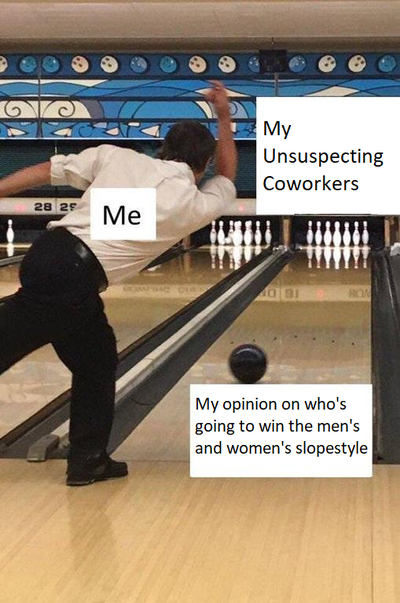 I don't really care who wins. I just want to see the riders utilize all those crazy features kids here would kill for to hit. Chances are that half of the field are just hitting the downrails or go for disasters and hit the straight take offs. Hopefully the judges will reward a creative use of the course. I'm stoked for the runs of Henrik, Joona Kangas and A-Hall. seeing how unique the course is, im hoping the judging has a bit of wiggle room for some creative riding and tricks. those rails and features are just too cool to just to rail-slide everything, ya know? DeebieSkeebies seeing how unique the course is, im hoping the judging has a bit of wiggle room for some creative riding and tricks. those rails and features are just too cool to just to rail-slide everything, ya know? I think the course suits Evan's, A-Hall and Woodsy's style. I'd bet on one podium run not having a triple. The riders all using the same rail features will only end when they put the rails at the bottom. Everyone is always too concerned with keeping speed for the jumps to do anything that might be cool but slow them down on the rails. Though this course might be a bit better. What's going down in practice? I posted a thread about this awhile ago and got no response, but i'll try again. Newschoolers should give out their own Gold, Silver, and Bronze medals based on the quality and style of a "throw away" run. It could be based solely on style? Could give a score for each feature then divide by the number of features once the run was a throw away to give an overall average score. Not that they don't already, but maybe if the pro's knew of it then we could all see some big stylish tricks on the Olympic slope course? a_pla5tic_bag The riders all using the same rail features will only end when they put the rails at the bottom. Everyone is always too concerned with keeping speed for the jumps to do anything that might be cool but slow them down on the rails. Though this course might be a bit better. id be really shocked if henrik doesn't win if he puts down his run that he wants, that course with the amount of creativity looks unreal. Hopefully they get some good weather so we can all witness a great show. lilvg22 Hopefully they get some good weather so we can all witness a great show.